The Navy (Australian, New Zealand and British) played a key role in the Far East and we'd like to show more images and publish more stories on this page that we have dedicated to them. Here is page 2 of our memories of Operations at Sea. "Guys, even as a Kiwi, I served first on HMS Ickford and then HMNZS Santon... Go for it with all you have. You deserve the honour. If your country can't bring itself to recognise you....then rest assured, we do from down under..."
"Yeah, be happy to Barry. It's a great site and your cause needs support. Having served for a couple of weeks on Ickford, I considered myself, at least in part, to have been treated similar to your guys, (for my RN time). [Rod refers to teh ban on Brits wearing the PJM. Ed]. I have one of your badges and wear it religiously even when challenged by our own Returned Services Association, so the cause is better known here as a result." That sort of support from 'down under' Is very humbling to us Brits who are fighting for a very simple justice - the right to wear the medal we have earned. Rod's images will bring back many memories ... but then read what he wrote 40 years after he served in the Far East. Ring any bells? In the singlet -Wally Pitman, on the bunk - 'RN Andy' (he was co-opted over from the RN for experience), bright eyes is yours truly, Banjo Hinchco, and the sleepy looking character went by the handle of 'JB' (Could have stood for 'Jelly Bean'). This was taken Nov 16, 1965, Banjo's 21 birthday, so the grog was smuggled stuff." 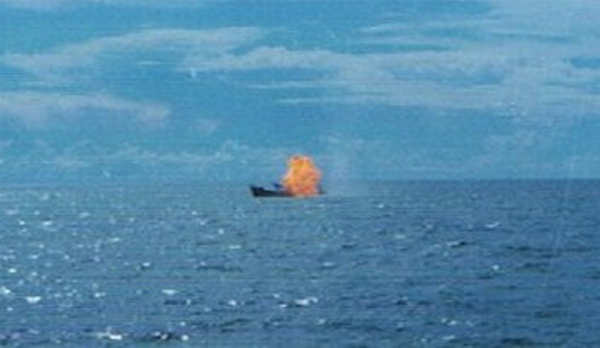 Rod then says: "The other shots are simply hits mostly in the Malacca Straits, after the 'close encounter' routines, as depicted in the photo I have sent you." This image is titled "The Old Way"
on the river, cold, serene. in this dream. This frightening dream. No sound, save an eerie murmur. No perspective, just a paling grey. It seemed the world was made of nothing. No flop of fishes on the run. No wild fowl flapping cross the water. It seemed the world and I were one. to kill them all, and save not one. with giant legs astride the path. The waters even started trembling. and volleys from the bridge above. he'd become a snow white dove. They'd send his tags back to his family. They'd say he'd done his duty well. Oh how the livings chests would swell. Someone died. Plucked like a petal. not worn, but stacked at heavens gate. all to fight another’s war. and when they died, ten thousand more. They'd dress the dead with pomp and glory. to fill out where their legs had been. Think of the glory, these brave lads bring. The Generals hardly felt a thing. send them all your fathers too. Dig em out, from kids to lovers. They will take them all. There's still too few. The more we lose, the greater glory. It matters not for whom they die. It all started with a bloody lie. I said you'd find it evocative and thought-provoking! This first message was received some time ago. Unhappily, I have to report that Pete died in June this year (2009). Yet another ex-serviceman from Malaya-Borneo dies knowing that civil servants wanted to prevent him wearing the medal he had earned and that they had knowingly prevented The Queen from giving him Her permission to do so - just as She had the rest of the Commonwealth! 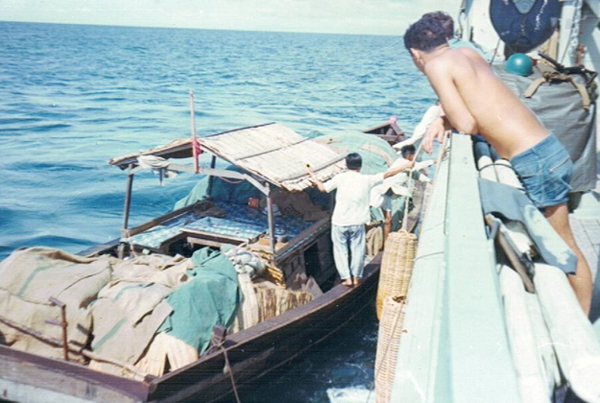 Comment =I served on HMS Ickford and saw the dirtier side of the confrontation in 1964, both in the Singapore Straits and Borneo. Please let those who gave life and limb wear their medal with pride. We had the task of bringing the above mentioned vets home to safety. A job that was not pleasant. 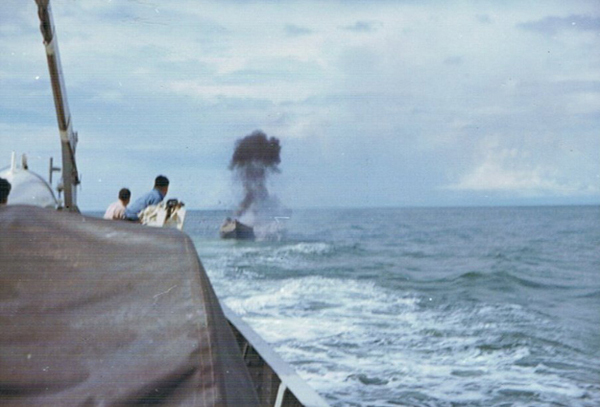 Comment =I served with Pete Swann on HMS Lincoln And HMS Ickford on both Borneo patrols and in the Malacca Straits. If you watch the Remembrance day Ceremony at the Cenotaph, try counting the Medal ribbons on the chests of our illustrious members of Parliament. I think you'll find nearly one!! Perhaps this explains the shoddy treatment our current and ex-servicemen receive at their grubby little hands.